Editor’s Note: Inspire Meis a series in which entrepreneurs and leaders share what motivates them through good times and bad, while also sharing stories of how they overcame challenges in hopes of inspiring others. Five years elapsed between when Sarah Jones came up for the idea for her organic baking line and when she finally left her job to run her Miss Jones Baking Co. full time. 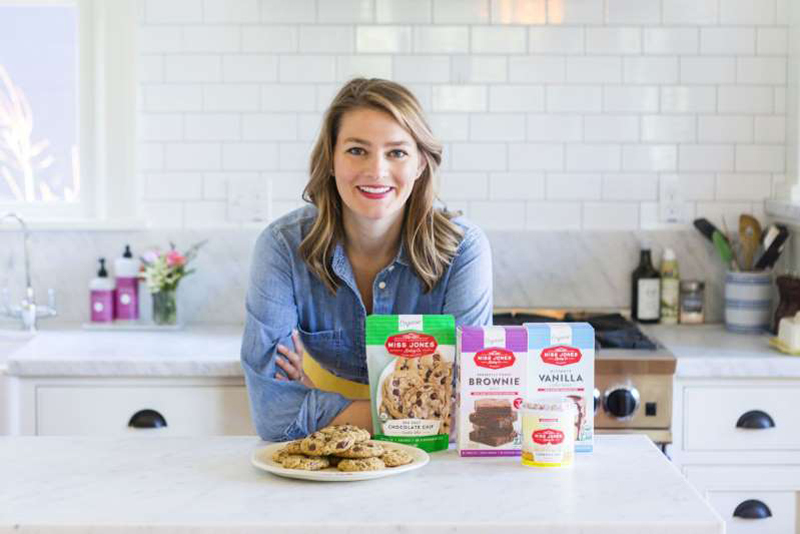 Multiple media immediately dubbed her "the Millennial Betty Crocker," not just for her relative youth (she's about to turn 34) but for the fact that her millennial peers tend to flock to pre-prepared, pre-diced food. What Jones wanted to add to that trend was baking products that are actually healthy. Her specific product idea? Organic cake mixes, frosting kits and ready-to-eat "dessert cups," brownies and cookies -- all designed to give busy moms and businesswomen the gift of time. Jones's central assumption turned out to be correct: Today, Miss Jones Baking Co. products are sold on Amazon and across the country at major stores like Fairway, Target, Safeway and Whole Foods. Jones says that the experiences of her customers, and the trajectories of her fellow entrepreneurs in her network, are what inspire her most during tough moments. That's how we came to speak with Jones about how she overcomes challenges and stays motivated and to hear the advice she has for other female entrepreneurs. What was the last major challenge you had, and what inspired you to work through it? The hardest thing was getting frosting manufacturing going. We created the first-ever organic frosting. When I was trying to find a frosting manufacturer, there was only one at the time, and they did frosting for the big guys -- the Betty Crockers and the Pillsburys of the world. They didn't deal with startup companies, and they didn't deal with organic ingredients. I found a small manufacturer who was thinking about starting to produce frosting and to do it with natural and organic ingredients’ standards. But he wasn't ready to take the leap. I called him every year for three or four years. I finally built up a rapport with him over time, and he started to believe,This girl is really going to launch this product line, and I should make this investment. It took a lot of persistence and the passion that I had to make this product a reality. Once you get through something hard, you realize you can get through something hard again. The repetition and the practice of overcoming failure and overcoming challenges build up your persistence and your resilience -- and allow you to keep going forward. I like [Spanx founder] Sara Blakely. I hear her story, and it is really inspiring to me. I love her persistence, perseverance and the tactics she came up with to gain traction initially. She would just go into the Nordstrom stores and put her product on at the register. So many people wait and ask for permission to do things, but when you're an entrepreneur, you have to do stuff like that. You have to take a chance and do what you've got to do to get somebody to believe in you. We come back to the core of what we do in our mission: to build this generational baking brand and to help people bake better with our products. For me and the team, it's inspiring when you hear customer stories and see how your products are filling unmet needs for them and bringing them joy and helping them make memories with their families and friends. Finding a support system of people who are going through what you're going through. For me, I have a network of other female entrepreneurs -- some of them are moms, and I'm a new mom. I'm going through the process of trying to figure out, how do you be a mom and entrepreneur at the same time? It's about building that support network of people who are going through things similar to what you are, so you have people to lean on and people to look to for advice when you need it.